← Crescent Lake. 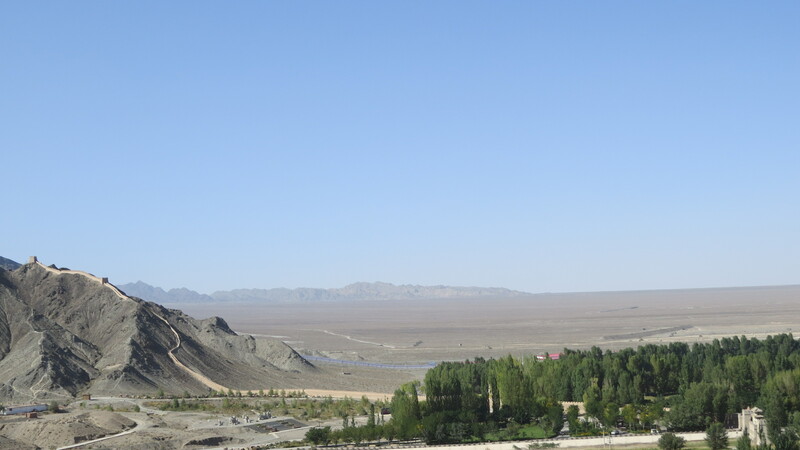 Dunhuang. Photos. 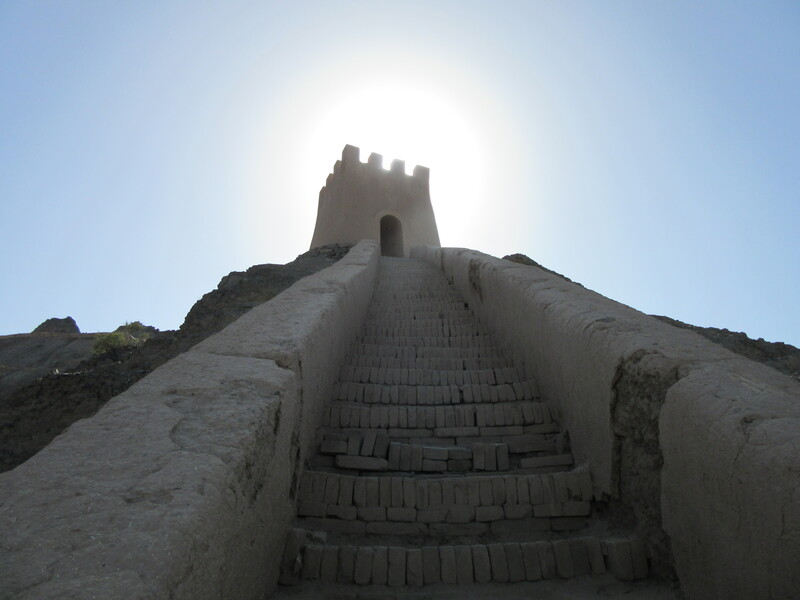 I am in Jiayuguan (pronounced Jiaooguan and spoken very fast. 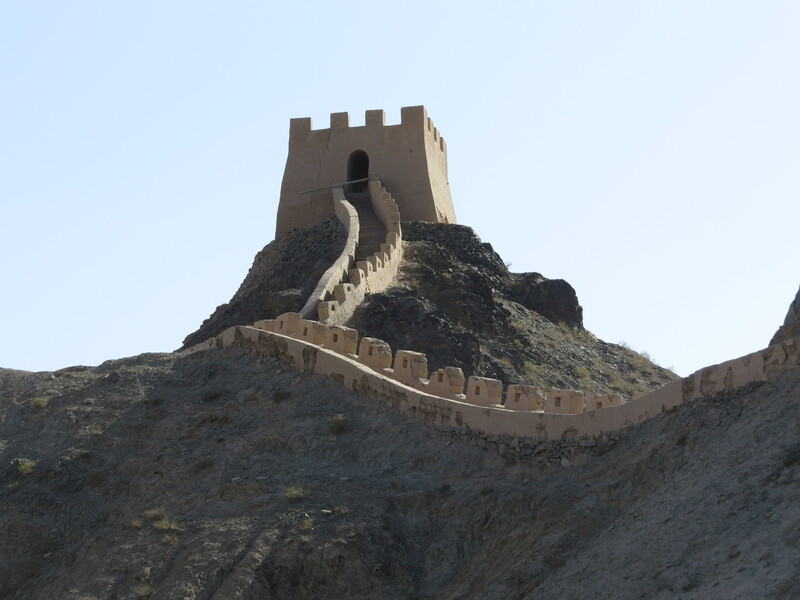 Just one syllable) which is a not very nice place but does mark the extreme Western point of the Great Wall. I visited what is referred to as ‘ The Overlook’ today and I was the only person there. No guides, no market place, no cars in the huge parking lot. Maybe it has something to do with the National Holiday. Fireworks started going off very early and have continued throughout the day. Boom Bang Bang echoing off the high rise apartment blocks. I made an attempt at looking it up and all I can come up with is ‘Mooncake Day’. Sounds delightful doesn’t it. Stretching away for thousands of miles. Right into the sun, but quite awe inspiring none the less. 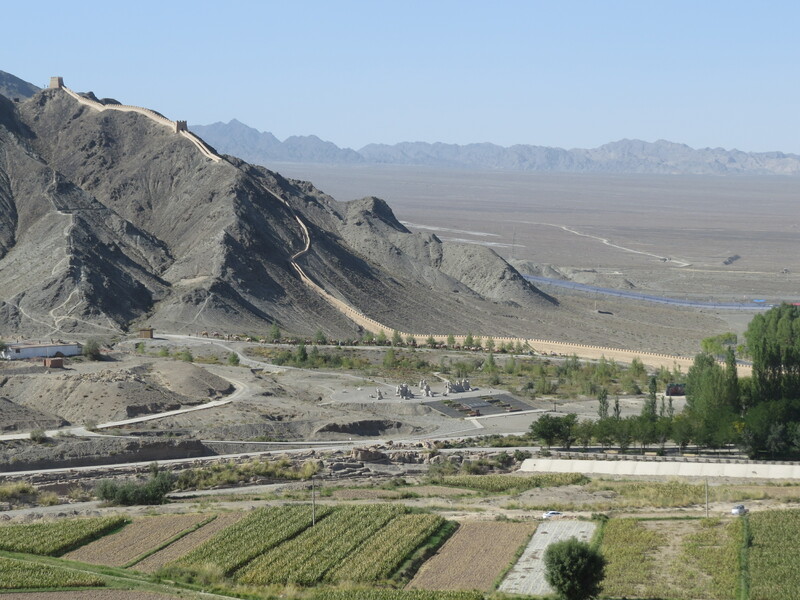 The Gobi in the background and one of those strange Silk Road memorials in the foreground. Right into the sun. This could either be an interesting effect or just terrible. More of same. Wall. Desert. Not sure if I could have walked up there. The position of the sun was problematical. 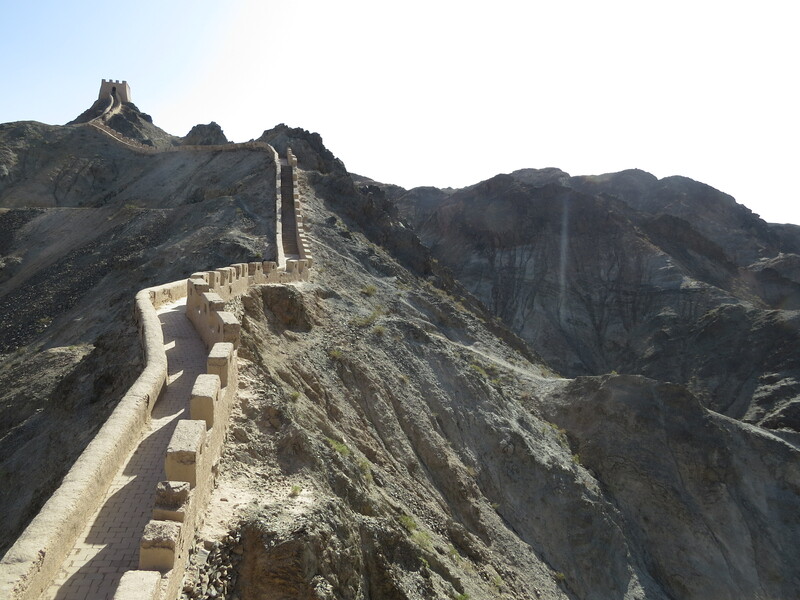 This entry was posted in Uncategorized and tagged Great Wall, Jiayuguan. Bookmark the permalink. Your entire trip seems like a life defining moment! Town of SA building sidewalks on Arroyo and The Alameda. I’m going to see Caetano Veloso at the SF Jazz Festival tonight. Be well!! A short but very atmospheric account with some superb pictures. Like Nixon said – ‘It’s a great wall!’. The upward ascent sounds a little perilous though. Speaking of which, any chance of seeing the ‘Dunes’ photos? If all goes to plan by the end of the week I shall be at the other end of the Wall. I think I may find more people around. I found there was not too much to say about walking on The Wall by myself, hopefully the photos say it all. 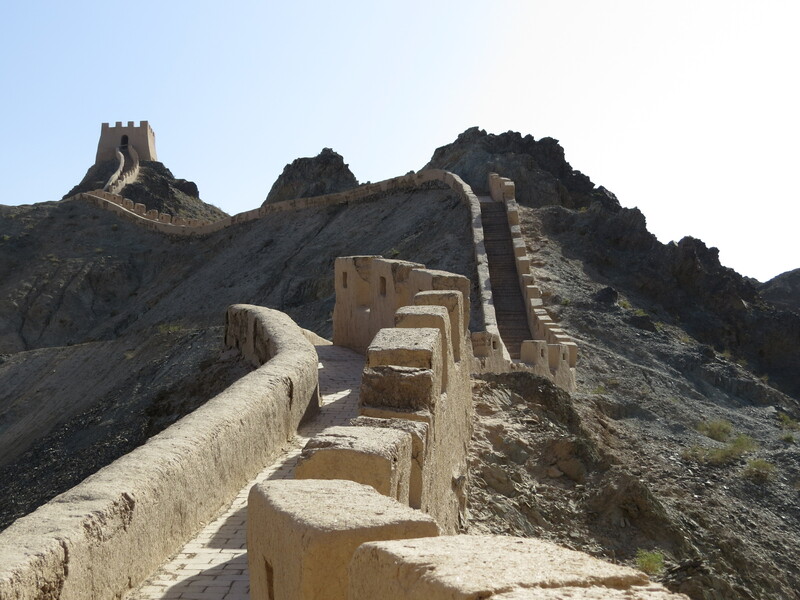 I know, its hard to comprehend isn’t it, not only that but it was built over two thousand years ago. On the road I go again tomorrow, the fast train from Xian to Beijing. It is a 1200 kilometer (750 miles) journey and it will take just five hours. Happy to hear you had a good weekend back in the Bay. PS. Oh look. A new email address. I shall use it from here on out. Great! Wow how courageous. Love the “merry group” pic. You look great in pink. So enjoying this blog & cannot believe how beautiful the wall is. Some people do a double take when I wear the pink scarf, but, hey, I like it too. 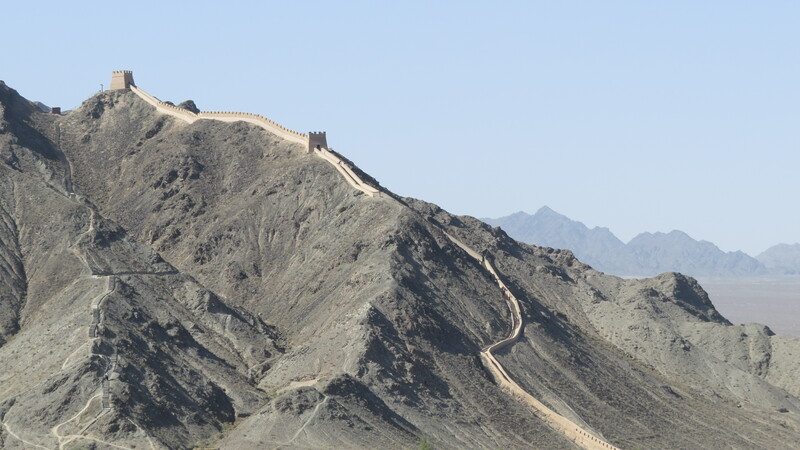 Hope to see some more of the Wall by week’s end outside of Beijing.